There are only a handful of non-profits in Calgary’s gay community that are long storied. In 1981, four members of GIRC created an athletic social group and called it Apollo Friends in Sport. Volleyball was their inaugural sport. Apollo players issued a challenge to a similar group in Edmonton and the Western Cup was born. Held every Easter weekend since, Western Cup is now 37 years old. In 2019, more than 1500 attendees and athletes will participate in sports tournaments of volleyball, bowling, curling, dodgeball, and hockey. The annual Western Cup Dance is a social calendar mainstay. Recently, Apollo made a donation to the Calgary Gay History Project, and we gladly committed to working on preserving and collecting the history of this vital organization. Grassroots and volunteer-run since its inception, Apollo Friends in Sport is part of the connective tissue of Calgary’s contemporary LGBTQ2 community and was a harbinger of Pride in the city. In 1995, I reported on Western Cup, for the inaugural issue of QC Magazine. I interviewed then Apollo President, Matthew Gillespie, and profiled some of the teams in competition. Winnipeg’s Golden Boys won the volleyball gold medal that year. (Calgary’s Fruit Loops came in third and occasionally showered spectators with their cereal namesake). 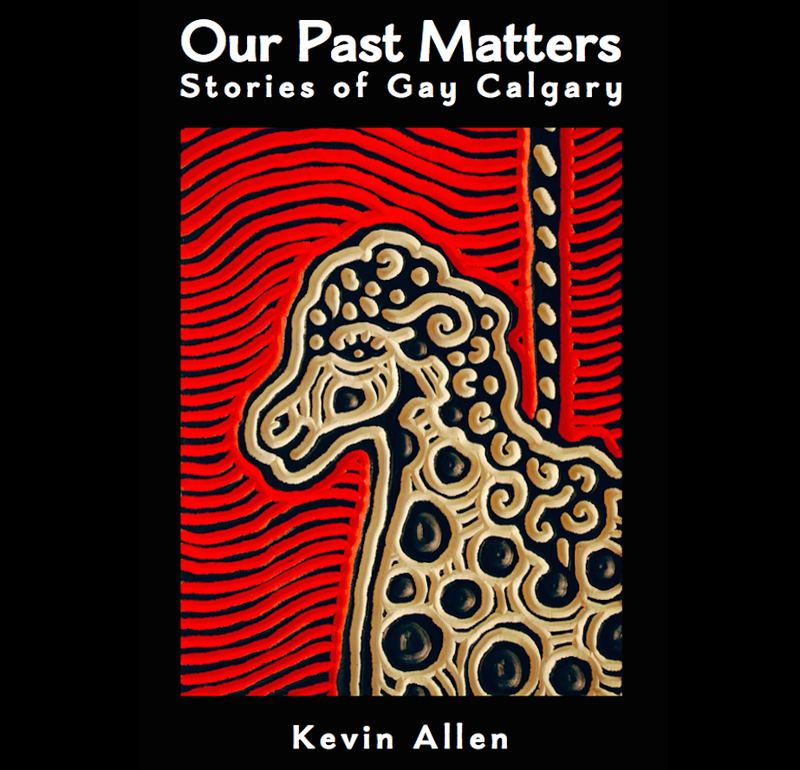 It was with great delight that we hauled 48 copies of Our Past Matters to the University of Calgary bookstore recently. It has been selected as course reading material in the upcoming Spring term (May-June 2019). The class offered through the Department of Women’s Studies is called LGBTQ+ Social Change History: From Stonewall to Calgary and is taught by Joe Kadi. A grad-student annotated copy of Our Past Matters. Our Past Matters was intentionally written to be accessible – eschewing academic publishing standards and tone. However, the Calgary Gay History Project is excited that the academy has found a place for it. Local queer history should be digested and discussed in our post-secondary institutions! University students were essential players in Calgary’s queer history from 1970 onwards. It is poetic to think that students taking this class are linking themselves to previous generations – on the same campus – through their interest in social change history. Countdown: 2 months to May 14th! The Calgary Gay History Project is commemorating the 50th anniversary of the decriminalization of homosexuality in Canada with a special event at the New Central Library. In November 1967, Everett Klippert was sentenced to incarceration for life for being gay by the Supreme Court of Canada. This prompted a very famous quote from then Justice Minister, Pierre Trudeau. December 1967: “Take this thing on homosexuality, I think the view we take here is that there’s no place for the state in the bedrooms of the nation, and I think what’s done in private between adults doesn’t concern the Criminal Code.” Source: CBC (click to watch video). On April 16, 1969, as Prime Minister, Trudeau presented the Criminal Law Amendment Act, (Bill C-150) in the House of Commons. The bill proposed to decriminalize homosexuality and allow abortion and contraception, along with other new regulatory measures on a number of less controversial issues. Debate raged in the House. The tone was rancorous and some Members of Parliament (MPs) were particularly shocking in their remarks. Bill C-150’s third reading passed on May 14th, specifically altering the crimes of gross indecency and buggery in private between two consenting adults aged 21 or older. Thus began a new chapter for the gay rights movement in Canada. We intend to honour this consequential day in Canadian history! Planning has begun for a special event at the Central Library from 6:30 – 7:45 PM! We are designing an evening which promises to be full of history, theatre, and art. We are also seeking input and participation: if you have an idea for the evening program email us. Celebrate Freedom: see you on May 14th!